The polishes decided on: Sinful Colors – I love you and Tip Top – Armour plate. I started with 3 coats of Sinful Colors – I love you on my pinky, middle and index and left that to dry completely. While I waited I applied 2 coats of Tip Top – Armour plate to my ring and thumb and left that to dry. When the Sinful Colors was dry I stamped using Pueen44 and Tip Top – Armour plate on my middle and index. I then top coated and done. I then top coated the ring and pinky as well one at a time and then I added the triangle rhinestones from Born Pretty Store onto the wet topcoat. And done! 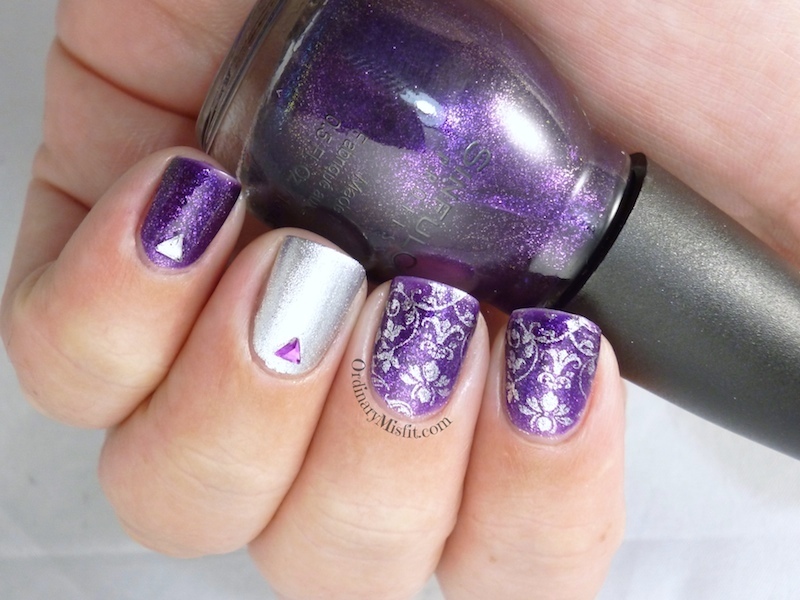 acidicice recently posted…Twin Nails with Ordinary Misfit! Thank YOU for the great choices. Loved this. Thanks so much V. I love you is SO gorgeous. Thanks so much Kerry. You are right, so royal. Pretty! Cool idea how you picked the components together and revealed them on your blogs! Thanks so much Lesley. I really had fun with this.